Activists were finally able to meet with officials from the Mexican Consulate in Chicago Monday morning. They’d been trying to arrange a meeting with Carlos Martin Jiménez, consulate general of Mexico in Chicago, ever since 43 students disappeared in Mexico after clashing with local police on Sept. 26. “He’s not our president,” chanted the group of about 70 people standing outside the consulate around 11 a.m. They say Mexican President Enrique Peña Nieto has allowed widespread crime and corruption to blossom under his administration. On Monday, activists were trying to deliver a manifesto to Jiménez demanding Nieto resign because he “openly associates with delinquent and criminal groups” and has institutionalized crime at the expense of democracy. While they were initially denied entry to the consulate at 204 S. Ashland Ave., the activists were able to overwhelm the building’s security a little before noon. 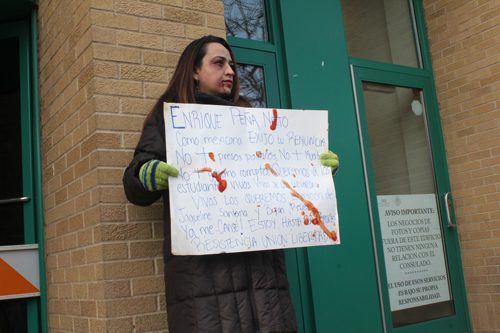 In a panic, consulate security called 911 and once Chicago police were on the scene an official from the consulate agreed to take the group’s manifesto and tentatively arrange a meeting with Jiménez next week at St Pius V Church, 1919 S. Ashland Ave.
As for the request for a meeting at St. Pius, Morales said consulate officials asked community leaders to submit a formal invitation to the consulate in writing. “We haven’t received anything from them yet,” said Morales. Mexico has erupted in widespread protests, some violent, since the 43 students went missing near the city of Iguala in the state of Guerrero in September. Jose Luis Abarca, the mayor of Iguala, allegedly ordered the attack on the students because they planned to protest a speech by his wife. Abarca reportedly had the students captured by Iguala police, who then turned them over to a gang for execution in Cocula. The mayor and his wife initially fled Mexican authorities but were taken into custody at the beginning of November. Because of the ongoing unrest, Nieto proposed over a dozen reforms last week that include a constitutional change giving the state control over local police and setting up a nationwide emergency number for Mexico, similar to 911 in the U.S.